For many travelers, a vacation is a chance to completely relax, get away from the daily grind and indulge in gourmet food and more than a couple of cocktails. For others, no trip would be complete without a chance to stay active a little each day. Whether you happen to be staying for a quick getaway at the Exotic Caye Beach Resort or spending more time at the Grand Baymen, the onsite San Pedro Belize Fitness Club can be the perfect way to stay active. Here are some of the amenities available at the fitness club, ways to stay fit while on holiday and how to take advantage of the facilities. One of the most relaxing ways to stay fit on Ambergris Caye is in the island's largest pool. Part of the San Pedro Fitness Club, this pool holds more than a quarter-million gallons of water, and it is divided into lanes for children as well as serious swimmers. For a more traditional workout, the San Pedro Fitness Club offers all of the modern gym equipment you might need. Whether you want to lift weights to maintain strength or take a walk on a treadmill and enjoy the air conditioning, you can do it all in this safe and supervised fitness facility. If you struggle with motivation, a great option is to stay active with group fitness classes at the San Pedro Belize Fitness Club. 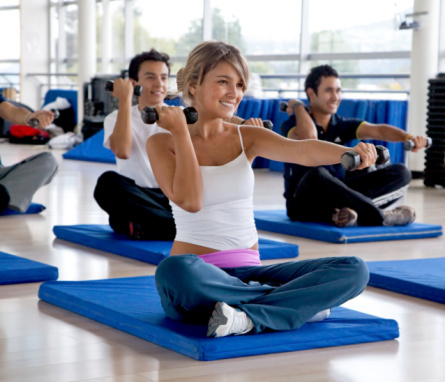 You could chat with your friends over an aerobics class, or you might want to try group yoga with your new neighbors. Sometimes, a little competition can making working out seem like a lot of fun. In the cooler evenings, the tennis courts at the fitness club are often busy with singles and doubles playing a game. Of course, not every workout has to be structured or even in a traditional gym setting. When you are in Ambergris Caye, there are plenty of fun options for recreation that include swimming in the ocean, snorkeling or even taking walks on the beach. The opportunities for staying fit and having fun on Ambergris Caye are limitless. Whether you love group fitness classes, swimming or even personal training, the San Pedro Fitness Club is your partner for keeping active.